The ornate lorikeet is a mainly green parrot about 25 centimeters long. Its head, above its eyes, is purple blue and its face, below its eyes, is red. There is red at the back of the head and yellow behind the eyes. Its chin to its chest has transverse green strips and bars of red and blue. Its abdomen is green with sparse variable yellow scalloping. The beak is red-orange, the irises are dark orange, the eye-ring is dark gray and the legs are gray. The range of the ornate lorikeet is North and South Sulawesi and Indonesia. Ornate Lorikeets inhabit the forest edge, secondary forest, bushy open terrain, and cultivated plots. Eggs hatch in about 27 days. Two eggs on average and young stay in the nest for about 80 days. 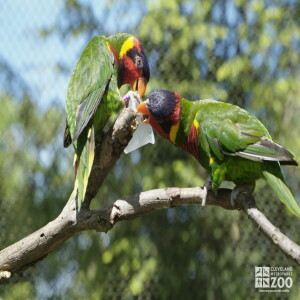 Oranate lorikeets are found mostly in pairs or small groups, sometimes with Green Lorikeets. Sometimes they will fly together in larger groups looking for food. Ornate lorikeets breed from May to December. They nest in the hollow of a tree trunk or a cavity at the end of a broken branch. Both parents feed and care for the young. At 7 – 8 weeks the young may leave the nest during the day, but return at night. By 9 – 10 weeks they become completely independent.